Firewood logs need to be kept dry in a log store or firewood shed after they are delivered to you so that they are always in low-moisture ready-to-burn condition. Unlike other cheaper models that can be lifted by one person, these log stores need a two person team to deliver them or build them. will last a long time under normal use. This storage shed for logs and firewood has been designed in a modular fashion, which allows you to have sections to store logs at different stages of seasoning.The longer the wood logs are stored the more seasoned they become. Check our free delivery areas below! 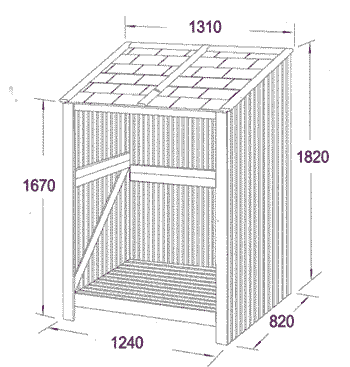 A typical logstore has slatted side walls made of wood with a roof which will not allow rain or snow to penetrate. 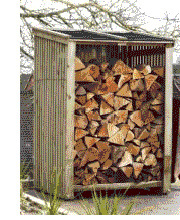 One log store holds 1.5 cubic metres of logs, if you are buying pre-dried timber this may be adequate for your needs. If you are naturally seasoning larger amounts yourself, just join two or more storage sheds together side by side or back to back. Remember burning dry wood will give you efficient, cost effective heating. 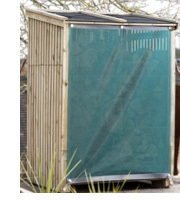 If you live in a more exposed area, you may benefit from fitting a weathershield to your firewood shed, to stop rain and snow wetting the wood when there are also high winds. The weather shield mesh has been proven through independent tests to provide better ventilation and weather protection than traditional cladding. Galebreaker weather shields have for over 20 years manufactured high grade weather protection and ventilation systems which are used widely around the world because of their excellent reputation. You can use Credit Cards over the phone or by online payment form after you contact us to arrange delivery and cost. CONTACT US FOR A QUOTE FOR DELIVERY TO THE FOLLOWING TOWNS. Ayrshire – Darvel, Galston, Hurlford, Kilmarnock, Kilwinning, Newmilns, Prestwick, Priestland, Stewarton, Newmilns, Moscow, Muirkirk, Waterside, West Kilbride. Stirling Area – Banknock, Denny, Falkirk, Grangemouth, Slammannan.